Numerical algorithm for calculating thin film cavitational effects is presented in this paper. Cavitation is a common phenomenon in diverging parts of thin film contacts, such as: journal bearings, ball bearings, seals, etc. Locating and calculating cavitational effects is very important for their applicability, efficiency and safety. The thin film flow solver based on the Reynolds equation, together with cavitation algorithm is implemented using the Finite Area Method inside the OpenFOAM framework. OpenFOAM is an open source C++ toolbox for computational fluid dynamics (CFD). The Finite Area Method is a two-dimensional counterpart of the Finite Volume Method, used for discretising partial differential equations over curved surfaces. Discretisation is performed on user selected patches of computational mesh, with values calculated at face centres and fluxes calculated at edge centres of each finite area face. Reynolds equation is a 2D partial differential pressure equation used for calculating thin film flows between two surfaces in relative motion, with the following assumptions: fluid viscous forces dominate over body, inertia and surface tensions forces; fluid film curvature can be neglected; variation of pressure across the fluid film is negligibly small. The implemented cavitation algorithm is capable of capturing both rupture and reformation boundaries during cavitation, therefore it is considered to be mass conserving. The implemented solver is validated on three test cases: single parabolic slider (1D), twin parabolic slider (1D) and microtexture pocket bearing (2D). The driving factor is an important technical feature of dynamical loaded working machines. It is especially important to know its value for the working wheel speed reducer of the rotating excavators. In this paper is presented a concept for determining the driving factor of a concrete gearbox speed reducer. To calculate the value of the driving factor according to the specified concept, knowledge of the load regime and the carrying capacity of the gearbox is necessary. The load regime is known from the load function, which is given in the paper, and is determined on the basis of the experimental measurements carried out for this purpose. The carrying capacity of the speed reducer is calculated by theoretical analysis according to the established methodology in this paper, for the characteristic pairs of gears determined in this analysis. As the most important gear pair, from the aspect of determining the driving factor, the most loaded gear pair is taken, in which during the exploitation of the speed reducer the most interventions are made, compared to the other gear pairs of the gearbox. The paper presents an exergy analysis of pressure reduction valve mounted in the steam propulsion system on conventional LNG carrier. From exploitation are obtained that the valve pressure and temperature decrease become as higher as steam system load increases. Valve exergy power input and output decreases during the increase in steam system load, mostly because of the steam mass flow decrease. Steam system load increase in exploitation also causes a decrease in valve exergy destruction with a simultaneous decrease in valve exergy efficiency (from 68.42 % to 68.09 %). The ambient temperature variation showed that the valve exergy destruction is the lowest for the lowest observed ambient temperature, in any steam system load. The exergy efficiency of the pressure reduction valve is reverse proportional to valve exergy destruction. An increase in the ambient temperature for 10 °C causes a decrease in analyzed valve exergy efficiency for between 2.5 % and 3 %. Generally, the most frequently used structural materials are metals which have high strength and stiffness. However, there are many cases, when other important properties come to the fore as well as high deformation by elastic behavior, high viscosity namely good damping effect. Vehicle components made of rubber usually exhibit large deformations. One of the most important properties of rubber is the ability to withstand large strains without permanent fractures. This feature makes it ideal for many engineering applications. On the other hand, the task becomes more complicated because of some features of rubber parts. The temperature of rubber increases significantly after deformations. Material properties of rubber change after these above mentioned temperature changes. Thus it is necessary to understand the mechanics underlying the failure process. 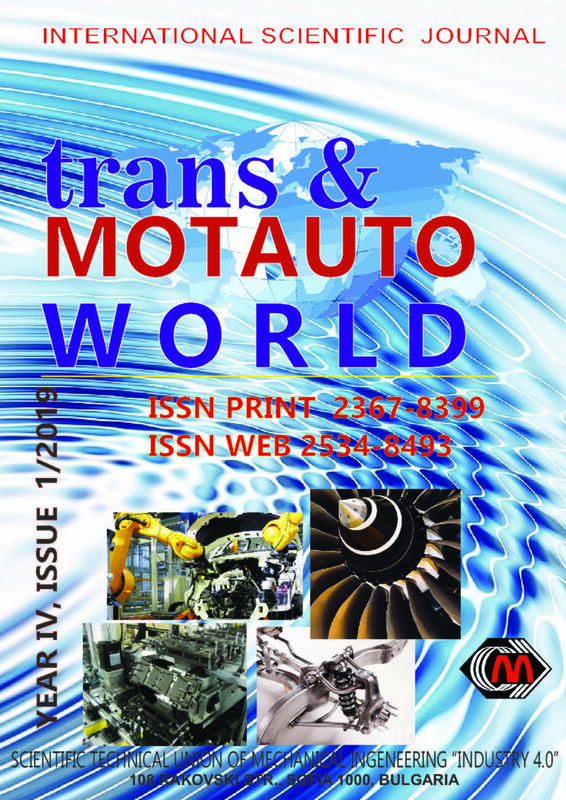 This paper summarizes the applied equations and the basic physical laws which are responsible for the theoretical background of the strain and temperature changes and the analysis approaches that are available for predicting fatigue life in rubber, especially in vehicle components made of rubber. Comparison of numerical methods for modeling the impact of an explosion on a metal plate such as LOAD_BLAST; LOAD_BLAST_ENHANCED; Arbitrary Lagrangian-Eulerian; Particle Blast Method; Smooth Particle Hydrodynamics which are implemented in the program LS-DYNA. The adequacy and accuracy of these methods are evaluated depending on the distance ratio to the explosive charge. The advantages and disadvantages of each method and recommendations for their use based on the results of this modeling and the experience of the authors of thisarticleare presented..
Transport has irrepressible contribution for the effective development of economy and society. But, these contributions are exceeded by harmful environmental consequences that transport growth causes especially in urban areas. Air pollution, acid rain, noise, climate change are just few of the problems which every urban area is dealing with. Hence, it is very important to provide development of the transport that at the same time could increase its sustainability and minimize environmental degradation. Numerous sustainable transport solutions are available with a potential to decrease these negative influences and promote mobility with higher sustainability. This paper presents a review of sustainable solutions, successfully applied in practice, as guidance for those urban areas that are dealing with the environmental problems from transport, but still are a step behind in undertaking activities. As of today, establishment of small port network has an important place in the development of small and medium businesses in maritime countries. They are among the most important tools having a positive impact on sustainable and equal development of small and medium businesses in the country. Small ports appear to us as the centers of regional economic activities. Export technology from a small port is is carried out much faster and easier compared to the large deep-water port hubs. A small port equipped with appropriate infrastructural facilities may also combine functions of harbor required for small fishing vessels and yachts. A small port can easily develop the yacht and cruise tourism. WHY COMMUNICATION THROUGH SOCIAL MEDIA IS IMPORTANT FOR RAILWAY BUSINESS PUBLIC RELATIONS? Railway transport has been seen as a backbone for sustainable transport system around the world. It is an essential contributor to the economies and the quality of life in many developed countries. In order to increase the volume of railway passenger transport, the railway managers have to influence customers’ satisfaction and to improve the quality of rail services. One of the communication tools railway companies uses to reach their passengers is Facebook. In this paper, the comparative analysis among different railway companies in selected European countries is done, in order to track good and less good examples of the usage of sites for social networking, i.e. Facebook. There are defined relevant criteria for making this relative comparison. After the analysis is done, the measures for improving the relationships with railway passengers are proposed. Nowadays, only a small percentage of waste tires are being landfilled in Albania. The large environmental impact has made the government to support some companies for building up the recycling industry of the waste tire in Albania. The Recycled Tire Rubber have been used in many fields such as agricultural uses, sport applications, civil engineering, rubber modified asphalt applications etc. Therefore, different parts of the world have used rubber modified asphalts where the benefits were being more widely experienced and recognized. Based on it, our paper will be focused on the asphalt mixtures produced with Recycled Tire Rubber Modified Bitumen’s (RTRMBs). Our proposal can reduce environmental impact from the waste tires and improving the quality of the road constructions in Albania. The most important element for achieving a sustainable development of aviation is human resources and the provision of opportunities for acquiring the necessary knowledge, skills and competencies. In this sense, aeronautical training schools are becoming more and more crucial for increasing productivity and competitiveness, as well as helping people realize their full potential and achieve their personal goals. The paper presents analysis of heat exchange and fuel consumption in the entire Marine Steam Generator (MSG) with steam reheating and in all of its components. Analysis is performed by using operating parameters from the steam generator exploitation. The highest heat amount transferred from combustion gases is used in the evaporator (48.17 % of the cumulative heat amount transferred in MSG). Proportionally, evaporator uses the highest fuel mass flow of 0.5172 kg/s when compared to other MSG components. In the high-pressure pipeline heat losses amounts 82.64 kW. Cumulative heat transferred from combustion gases to water/steam in all MSG components amounts 42048.47 kW. Cumulative water/steam specific entropy and temperature increase in the entire MSG is 4.5677 kJ/kg·K and 454.18 K, while the fuel mass flow in the entire MSG is equal to 1.0736 kg/s.